The Wrentham Housing Authority, Wrentham, Massachusetts has committed one of the most cowardly acts I've ever heard of. Story here in the Boston Herald. Apparently, a resident of the housing project was offended (HERE WE GO!) with a fellow tenant displaying the American flag outside their unit...on the Fourth of July. Residents were then notified by the Housing Authority that displaying the flag is now prohibited. "Due to a tenant's repeated complaints..."
So one tenant, who lives in publicly assisted housing which is funded by taxpayer money, paid by American citizens, is offended by the American Flag being displayed. 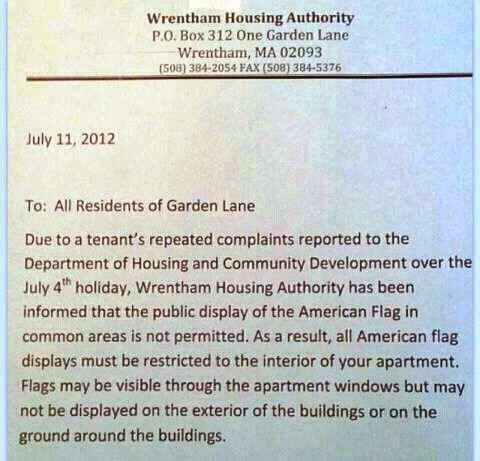 This means that the powers that be at the Wrentham Housing Authority banned the display of the American flag (emphasis added) in common areas because of one person. This is political correctness and cowardice gone way beyond the pale. Also of note the letter specifically states the American Flag. So other flags are permitted? Never mind that the authority caved in to the complaints of ONE TENANT, they also in writing have banned the display of the American Flag in common areas. If I lived there I would go out and buy about ten flags from other countries and display them all. But then, that likely wouldn't offend the idiot who complained. Another footnote: We found out this morning that a cashier in the building cafeteria was let go because she had tattoos on her fingers. Nothing offensive, but somebody complained and they let the poor girl go. This crap has really got to stop. I'm pretty sure I would go out and buy 100 American flags and put them up everywhere just to piss them off. If they don't like it they can move out....... of America.